So freaking, unbelievably frightful that humans should not be allowed to live in the state of Minnesota during the winter. Friday's high temperature will be -12. Yes, a high temperature of -12. Escape to Aruba. Which we will be doing next week. Wooo hoo. To all you crazy Minnesotans who take summer vacations, and look at me like I have 2 heads for taking a winter vacation: I am right and you are wrong. It is disgusting in the winter, and lovely in the summer. Escape when it is disgusting. Stay when it is lovely. Seems simple to me. Skip the fishing cabin, go to Aruba. Second, thing to do when it is heart-stopping cold outside? Bake. Here's an awesome recipe from a website I love. I made them the other day and then sent them immediately out the door to Jeremy's office so we wouldn't eat them. But they are fantastic. 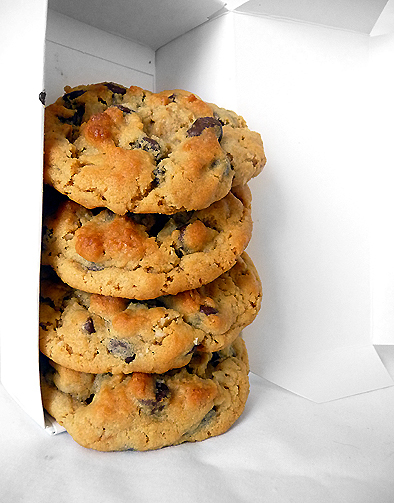 They don't make a ton of cookies per batch. Which is a good thing in terms of portion control. But if you want to feed a crowd, double the recipe. ♦ The cookies will not look “done” when you pull them out of the oven, but they will continue to bake on the hot baking sheets out of the oven. If they are slightly brown, the edges look just set and they are puffy in the middle they are ready to come out! ARUBA HERE WE COME BABY!!!! WAHOOOOO! !